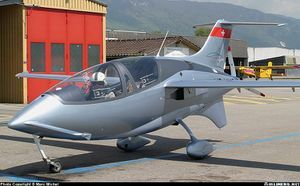 An AERIKS 200 at Grenchen, Switzerland. The Aceair AERIKS 200 is a Swiss sports plane of highly unusual design. It is being marketed in kitplane form. The AERIKS 200 has a highly-streamlined, bullet-shaped fuselage, with a T-tail and large ventral fin, pusher propeller, and canard. The pilot and passenger are seated in tandem. Development aircraft have fixed undercarriage, but Aceair is planning a version with retractable landing gear. Aceair ceased operation in 2004, and with it the Aeriks 200 project was cancelled. Ths was principally due to Diamond Engines cancelling the manufacture of the rotary engine the 200 was based around. This page was last edited on 5 March 2007, at 09:32.